Welcome to. . . . . . . . . . . . . . . . . . . Try out the New Hedges (VRML 2.0) Beta! Enter The Hedges Ver 2. Optimized for users of Netscape 3.0+, or older versions of Netscape with Live3D. 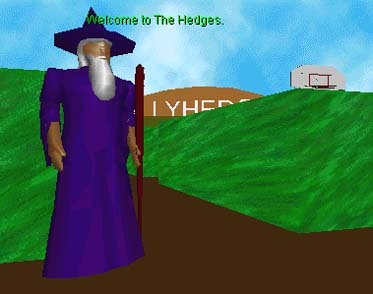 The Hedges is a Virtual (VRML) Hedge Maze. You can wander around the maze, trying to find the exit, or, even more fun, you can just browse around interacting with the objects lying around in the maze. For instance, find a football, click on it, and you will be taken to a page of cool sports links. Click on a stop sign and you'll spray paint it!